Childhood vacations to the beaches at Wildwood, N.J., created more than fond family memories for Lauren Cesanek ’15 (Whitehall, Pa.)—ocean and beach pollution sparked her passion for environmental sustainability. 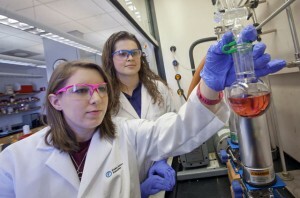 Lauren Cesanek ’15 works with Professor Roxy Swails in Hugel Science Center. Now, Cesanek is assisting with research that could help create a completely renewable fuel cycle. She and fellow biochemistry major Nabeel Chaudary ’16 (Belle Mead, N.J.) are working with Roxy Swails, assistant professor of chemistry, to develop and test new organometallic catalysts for use in the electrochemical reduction of carbon dioxide. “I’ve been interested in learning more about the environment and actively contributing to ensure that it is taken care of for future generations,” says Cesanek, who plans to pursue a career in environmental research or pharmaceutical and chemical sales. A catalyst, explains Swails, speeds up a chemical process and often increases the selectivity of a reaction, creating a more efficient process with less waste. Her work is focused on producing and testing heterobimetallic catalysts (small molecules that contain two different kinds of metal atoms). The compounds are difficult to make, but are capable of a variety of transformations that monometallic (only one metal atom) and homobimetallic (two metal atoms of the same element) cannot. “There is a huge amount of work being done on the electrochemical reduction of carbon dioxide,” says Swails. “Many monometallic catalysts are being applied to attempt to solve the problem; however, those found to be effective are either expensive or rare. If an inexpensive and efficient catalyst could be used toward the reduction of carbon dioxide to form methanol or methane, it would permit the formation of a completely renewable fuel cycle. Undergraduate research, which Swails calls “the quintessential learning experience,” shaped her career and life choices, and she is eager to share that same opportunity with her students. Cesanek’s passion for the environment doesn’t stop with her work in the lab. This January, she traveled to Ostional, Costa Rica, with the Alternative School Break Club to participate in a beach clean-up and assist with olive ridley sea turtle conservation. The group took nightly patrols to deter poachers and helped lead hatchlings to sea. The Nature Conservancy’s carbon footprint calculator measures your impact on our climate.